My girls have friends over to play. It is awesome because they are happy and busy. What isn't quite as awesome is they decided to play "puppies." So four little kids are crawling around my house, barking. And if you didn't know, kids have pretty high-pitched voices. Then there's poor Rowdy. He pretty much hasn't moved since the barking started. I can just imagine he's wondering if they are trying to play with him, taunt him or just annoy him. And since he can't see them (he is blind), he figures he'll just play it safe and steer clear of them. So our summer fun today was the playdate, which is actually me watching my cousins kids. But our kids (she has two boys almost the same ages as my girls) play great together, so it is an easy gig. To finish off the day, I ran two miles. I was going to take one more rest day, but I needed to run both mentally and physically. So I took my sore calves upstairs at 9:30 that night and put in two slow miles on Millie that were TOTALLY worth it. Then this afternoon I ran six miles. I wanted to die the first half mile. But once my legs warmed up and I got in the groove, it was a perfect run. One of those runs that reminds me why I love running. yayyyy! LOVE reading about your run. Love those runs that remind us why we are out there running! awesome! Also...you are running Vegas as well??? me too!!! woo hooooo! and I totally used to be that kid roaming around the house barking...haha! haha!! That last picture is how I look when I get my picture taken. :) I love those runs, too!! That last paragraph = heaven to read. I love the painted swing! Great job on the runs. Lately I haven't been feeling the running, so it's nice to read some motivation. Playing "puppies!" I love it. My brother and I used to play all the time, mostly to try to convince my parents to get us one. I have no idea why it never worked ;). Nice job on your runs! The swing set looks great. Can I come over for a play date? 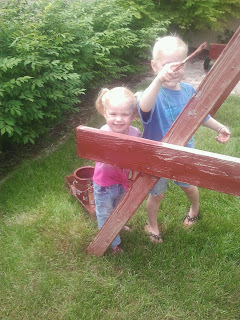 Your girls are so cute and the swingset looks great. Awesome job on the run. You are a rockstar! Yeah, "I Have Run" sounds a tad better than "I wanted to die." You are doing this marathon training right and you're gonna have a great race. BTW, nice of you to recycle. 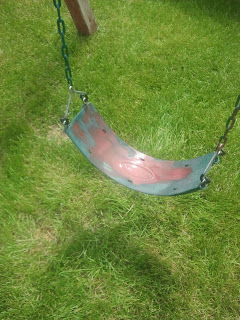 That Before pic of the swingset looked a lot like the Where's Waldo baby robin pic, didn't it?